The authorities intervened nine days later, but the family say they are still scared, and that villagers have warned them that no one would help deliver Meena’s third child, due within a month. The girl was ostracised for stepping on the egg of a ‘titihari’. It was a special occasion and Meena Regar looked on happily as her daughter laughed with children of her age, waiting for her turn to have a glass of milk. 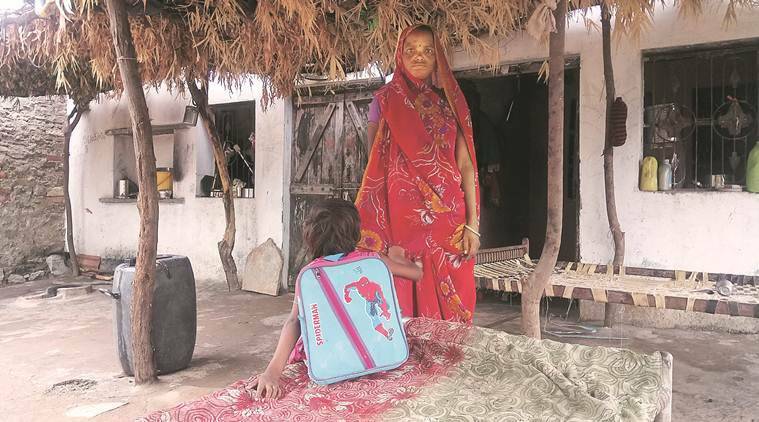 Barely a fortnight ago, they had enrolled the 5-year-old in Class 1 of a government school in Haripura, a tiny hamlet nestled between the Aravallis in Rajasthan’s Bundi district. On July 2, like many other parents, Meena had gone to witness the launch of the state’s Annapurna milk scheme under which, for the first time in the state, milk was being made available to students in schools. “As she was standing in the queue, my daughter mistakenly stepped on the egg of a Titihari (Red Wattled Lapwing). A large crowd gathered as it is believed in our village that the egg of this bird is sacred,” says Meena. The same day, the caste panchayat allegedly ordered ostracisation of the girl, and told her to stay out of the family home for 10 days. Meena’s husband Hukumchand, who works as a labourer at a cow shelter 10 km away, says he rushed home on being informed what had happened, and approached the caste panchayat on his own. “The elders said they would ostracise my daughter unless I pay back Rs 1,500 that I had taken as loan from one of them three years ago,” says the 32-year-old. He claims that the caste panchayat members also demanded “a bottle of plain (country liquor)” in order to absolve the child of her “sin”. Hukumchand says that he was ready to give them the liquor, some gram and a packet of namkeen, but pleaded that he be allowed to return the Rs 1,500 a month later, after his wife’s delivery. He alleges that the girl was ostracised following this, and told not to enter her house for 10 days. After the police and district administration came to know, the girl was allowed back into the house and a case registered against 10 men from the village. Four of the men were arrested Tuesday. The Rajasthan State Human Rights Commission has sought a report. At their clay house, the child, the couple’s eldest, follows Meena everywhere, a blue school bag slung over her shoulders. Family members say they never let her out of their sight apart from when she goes to school. Gyarsilal also alleges that Hukumchand was drunk when he appeared before the panchayat and had declined to pay the borrowed Rs 1,500. Villagers say at least one such case comes before them every year, and the person concerned has to do certain rituals as atonement. However, no one is willing to confirm whether there have been past instances of ostracisation. Another villager, from a different caste, Bhagwan Saini admits it is wrong to blame the girl. As a Titihari lays eggs on the ground and in bushes, unlike other birds, anyone may step on them by mistake, he points out. He adds, “Even if the caste panchayat felt the girl had committed a sin, they could have given her a less harsh punishment.” However, Meghwanshi denies the family’s claims of receiving threats. “We are investigating the case,” says Inspector Lakshman Singh of Hindoli Police Station. Meanwhile, over at Government Primary School, Haripura, another Titihari has laid eggs in a corner of the sprawling grounds. The children look from afar at the bird nestling her eggs.